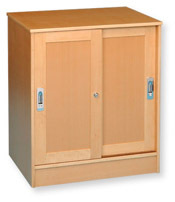  Stock cupboard with 2 adjustable shelves and lockable doors. 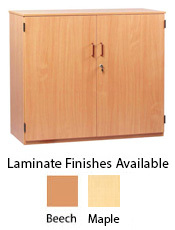  Available in a choice of two laminate finishes: beech or maple.  Dimensions: (HxWxD) 768 x 1024 x 475mm. 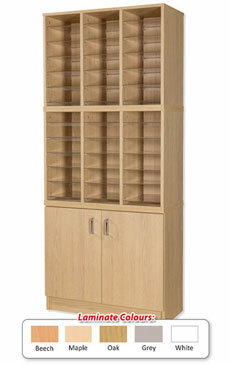  Stock cupboard with 2 adjustable shelves, 1 fixed shelf and lockable doors.  Dimensions: (HxWxD) 1018 x 1024 x 475mm.  Dimensions: (HxWxD) 1268 x 1024 x 475mm. 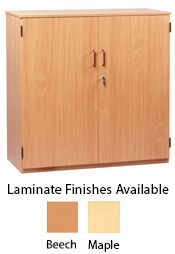  Availble in a choice of two laminate finishes: beech or maple.  Dimensions: (HxWxD) 1518 x 1024 x 475mm. 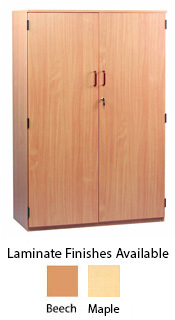  Stock cupboard with 4 adjustable shelves, 1 fixed shelf and lockable doors.  Dimensions: (HxWxD) 1818 x 1024 x 475mm. 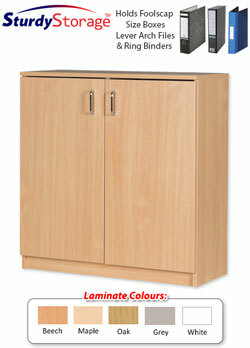  Stock cupboard with 2 adjustable & 1 fixed shelf, lockable doors & coloured edge feature.  Dimensions: (HxWxD) 1268 x 1030 x 477mm. 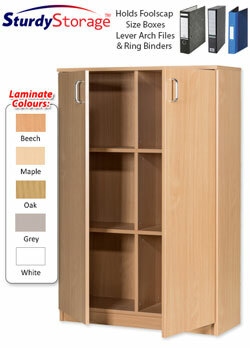  Stock cupboard with 4 adjustable and 1 fixed shelf, lockable doors & coloured edge feature.  Dimensions: (HxWxD) 1818 x 1030 x 477mm. 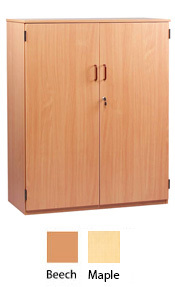 High quality Sturdy Storage file storage cupboard units are manufactured with solid 18mm MDF throughout as well as solid 8mm backing. Featuring a choice of attractive coloured edging.  Unit can fit foolscap box size files. 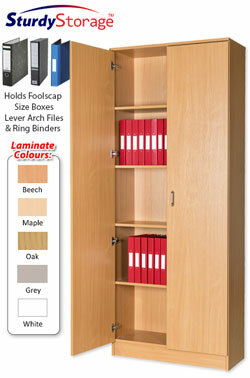  Suitable for Lever arch files & Ring Binders also. 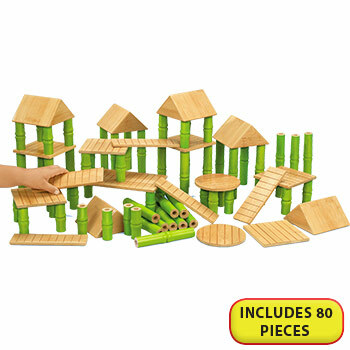 Manufactured with solid 18mm MDF throughout as well as solid 8mm backing. 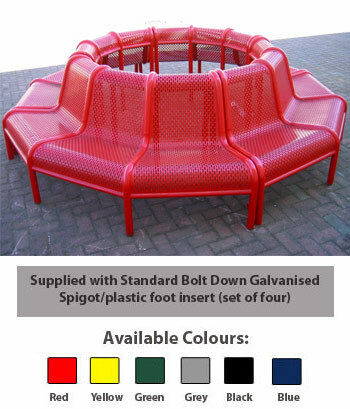 Featuring a choice of attractive coloured edging. 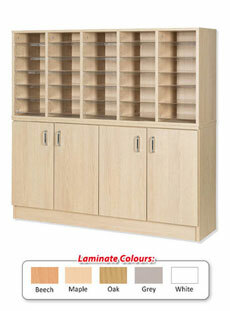 High quality Sturdy Storage file storage units are manufactured with solid 18mm MDF throughout as well as solid 8mm backing.  Unit can fit approx 20 foolscap box size files. 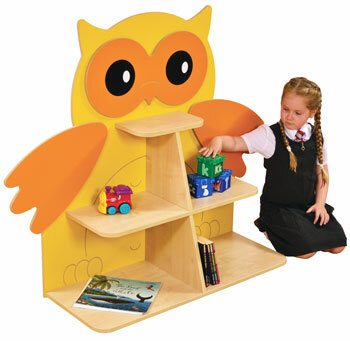 Manufactured with solid 18mm MDF throughout as well as solid 8mm backing in a choice of laminate finishes. 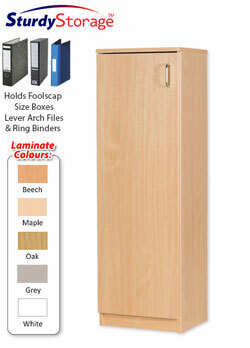  Unit can fit approx 40 foolscap box size files. 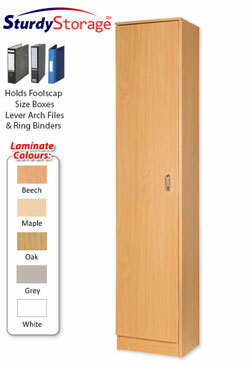  Unit can fit approx 25 foolscap box size files. 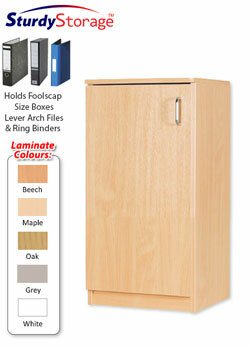  Unit can fit approx 50 foolscap box size files. 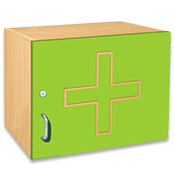  Unit can fit approx 10 foolscap box size files.  Unit can fit approx 15 foolscap box size files. 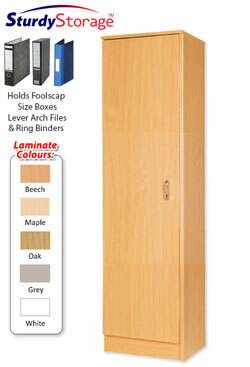  Unit can fit approx 30 foolscap box size files. 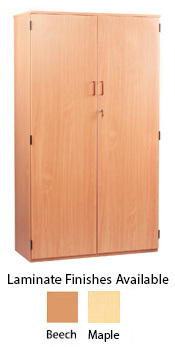 Cupboard with hinged doors and two adjustable shelves. 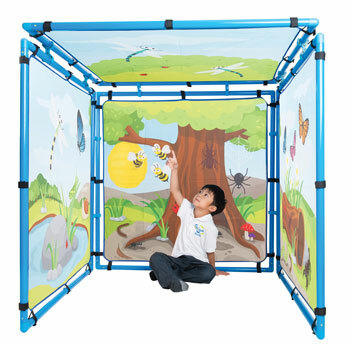 This unit also includes an internal rail to hang "big-book" bags. 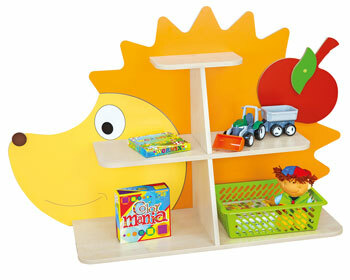 Shelves can be removed/adjusted to accommodate these. 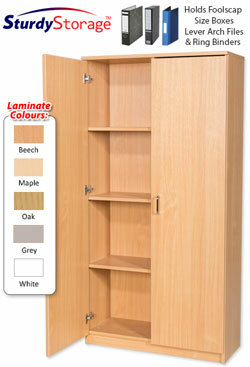 Solid wood cupboard with sliding space saving shaker style lockable doors complete with shelving. 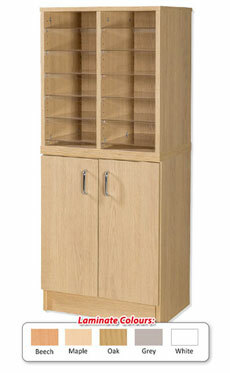 Manufactured from beech veneered panels and solid beech edging. Please allow 10 to 14 days for delivery. 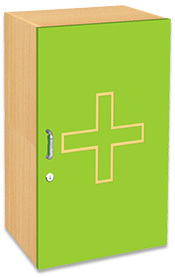 Wall mounted first aid cupboard with lockable door. Features metal handle and 'First Aid' symbol on door. 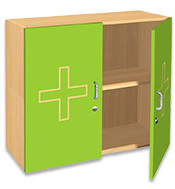 Wall mounted first aid cupboard with shelf and lockable door. Features metal handle and 'First Aid' symbol on door. 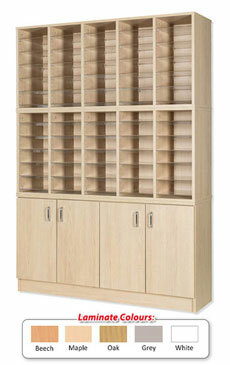  Fully assembled 21 Tray Storage Cupboard.  Lower section has 3 bays of 7 Gratnell trays. 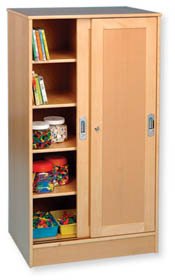  Upper section has 2 adjustable shelves and full locking doors. 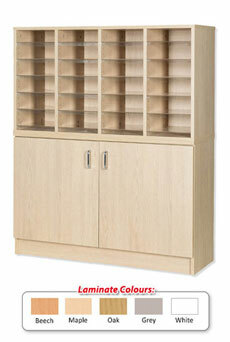  Fully assembled 36 Tray Storage Cupboard.  Lower section has 3 bays of 12 Gratnell trays.  Upper section has 1 adjustable shelf and full doors. 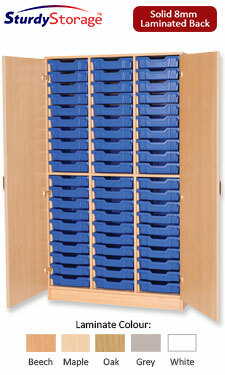 Fully assembled 45 Tray Storage Cupboard. Lower section has 3 bays of 15 Gratnell trays. Upper section has 1 fixed shelf and full doors. 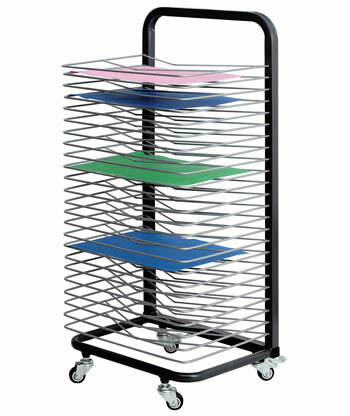 Fully assembled "SturdyStorage" 60 tray mobile storage unit. 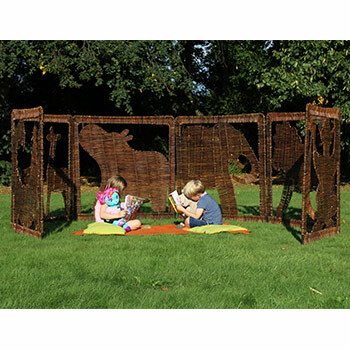 Made from super strong MDF panels with a 5 year guarantee so built to last! 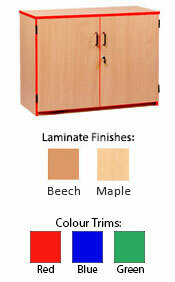 Choose from 5 laminate colours. 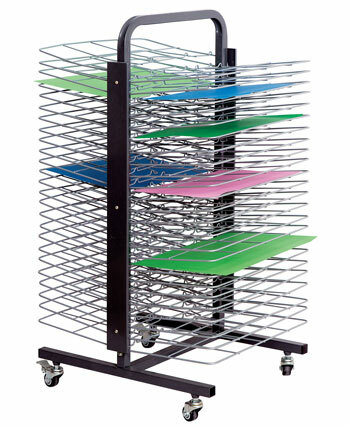 Customise your unit with any combination of tray sizes and colours to suit your needs all for the same price! For security why not add optional locks for the doors? Simply select from the relevant boxes below. 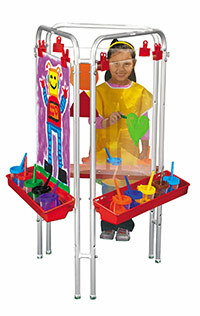 Your unit is manufactured to your order. 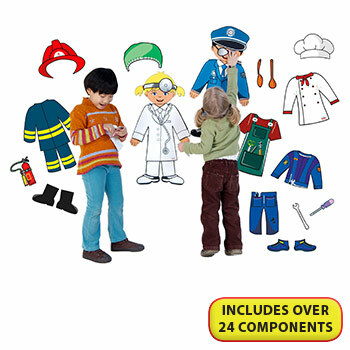 Please allow approx 3-4 weeks for manufacture and delivery. Delivery is free of charge to UK mainland. FREE delivery. Please allow 2-3 weeks for delivery. 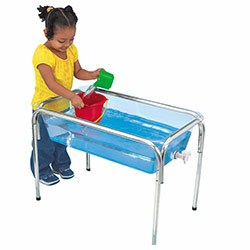 Supplied with sliding doors and 12 deep clear and 8 shallow clear trays as illustrated. 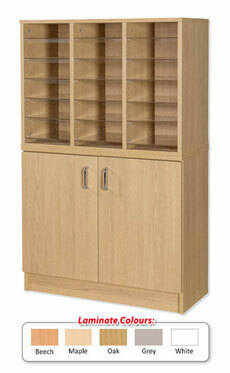 Manufactured to a high quality, these pigeonhole units with cupboards are ideal for sorting post and organising mail. 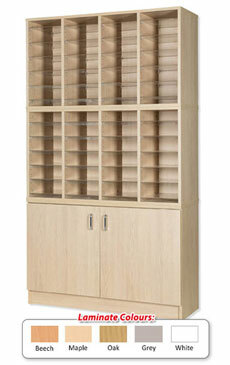 All pigeonhole units are manufactured with 18mm solid wood MDF in a choice of beech, maple, oak, grey or white laminate finish with a durable bump resistant edging. 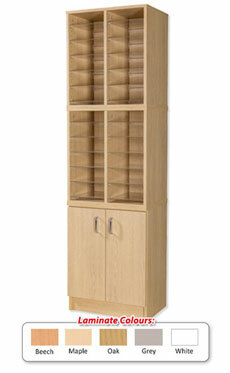 Pigeonhole units are solid and quite heavy but they have been designed to act as modular units which can simply connect together with the supplied fixings. 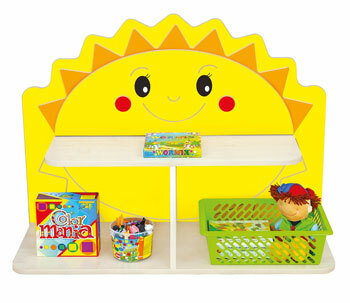 Featuring a cupboard as the base of the unit, this provides extra storage space when needed. 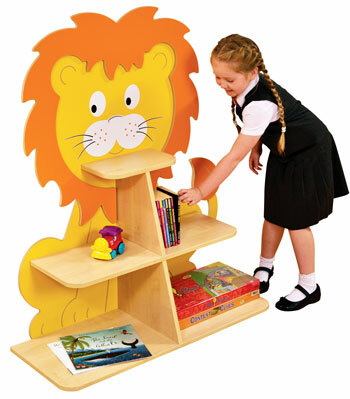  Units come supplied with Acrylic clear shelves - each shelf are sturdy and 3mm thick and are also supplied with name slips. Click here to see and download names slips - To download the Word Document, click then save in the location you require. 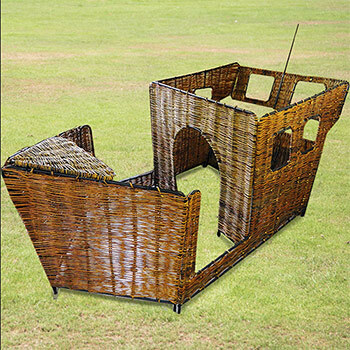  Delivered fully assembled, ready to use. 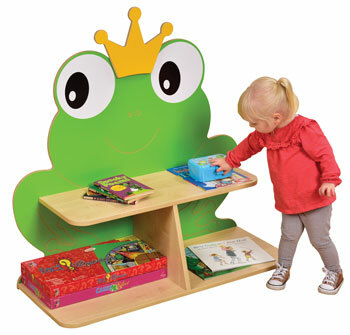 Manufactured with 18mm solid wood MDF - back panel is 8mm in beech, maple, oak, grey or white laminate finish with a durable bump resistant edging. 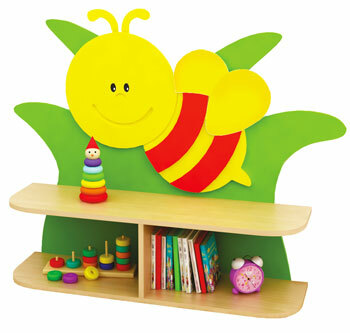 Please Note: Acrylic shelves are supplied with a protective film on both sides that should be peeled off before use and then you can apply the name labelling strips.